The University of Akron established itself in 1870, affiliated with the Universalist Church. In 1913, the ownership transferred to the city of Akron, Ohio. The football team didn’t play its first game until 1891, but it’s real claim to fame was that Akron was the first school to move from Division I-AA to Division I-A football in 1987. Now, the success hasn’t shown itself yet on the field, but Akron paved the way for other schools who have become successful. Akron did win the Mid-American Conference Championship in 2005, however. The nickname of the Zips came from a strange place for Akron. BF Goodrich is a local Akron company and they produced a pair of rubber overshoes called Zippers. The name was adopted in 1925 and shortened to Zips in 1950. Right around that time, the school decided that they needed a mascot and sprung into action by doing what schools do best: forming a committee. 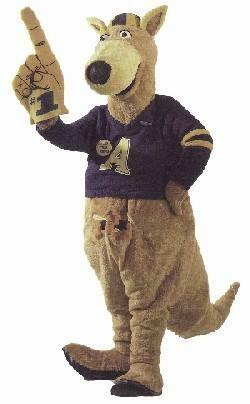 After three long years, the kangaroo won the vote and they doctored up a costume to go with. 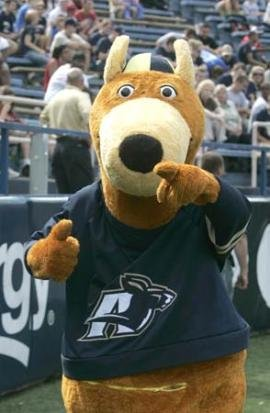 When the school went to big time so did Zippy, as he won the Capital One Mascot of Year in 2008. So let’s check out this sprightly marsupial. 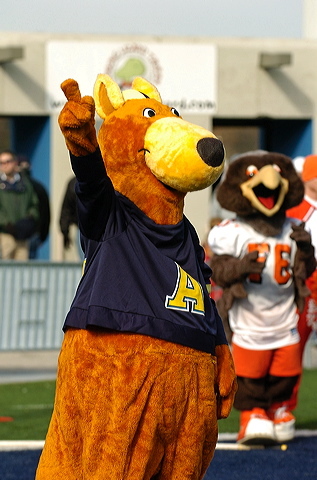 Zippy is a kangaroo and Akron made sure to let me know by showing off the pouch that sits in front of the costume. Zippy’s gone Disney with his choice of garb. That’s right, He has a respectable beanie or hat on top with a sweater vest to keep him warm. No pants. You know, if he needs pockets, then I guess the pouch would work fantastically. The tail juts out from behind and I’m not so sure those legs could spring Zippy to high jump records anytime soon. So I use some lists online to help flesh out weird and wacky mascots. What can I say? Every good writer needs their go to research spots. Anyway, Zippy the kangaroo was on the list and I’m having a hard time finding out what’s weird. The only wackiness in my eyes is the difference between the mascot type and the name of the school. I believe a kangaroo can zip, but usually they hop or jump. That’s about it. So really, Zippy is not weird or wacky. Zippy’s just okay. He’s also a Mascot of the Year winner. That’s way better than some regular looking mascots. What I need to do, and will encourage you as well, is to petition those who call this mascot weird and have them remove Zippy off the list. It’s the right thing to do. A name is a name is a name. Just ask Bono, Madonna, Prince, and any other uppity pop music megastar.